Heated arguments took place when the police stopped the activists of various groups who were extending in support to taking out the rally. 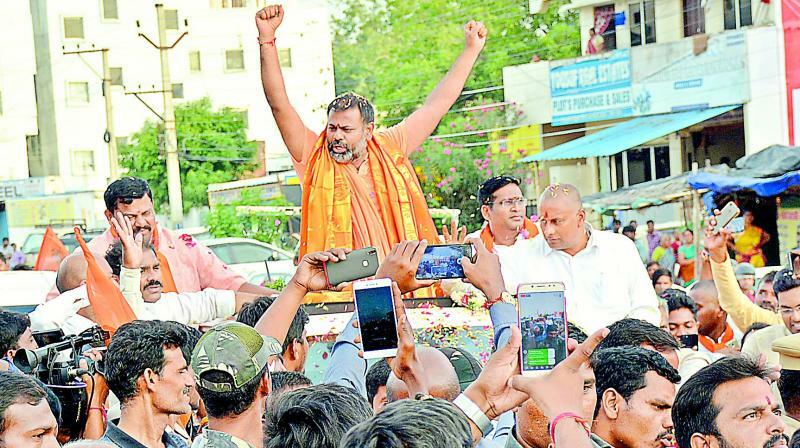 Hyderabad: Tension prevailed at Abdullapurmet when a group of people including BJP MLA T. Raja Singh wanted to take out a rally in connection with the return of Swami Paripoornananda to the city on Tuesday. Activists of VHP, BJP, and few other right-wing organisations went to receive Paripoornanada at Ramoji Film City area in Abdullapurmet. Learning about the huge gathering of the public who wanted to a rally of bikes and cars, the police stopped the activists from proceeding further towards the city. Mr Raja Singh has pushed away the the barricades and argued with the police for the rally. However, after convincing them that there would not be any violent activities, the rally was allowed towards the city.